Last year I published the article posted below about Russia’s March of the Immortals. This march, which commemorates the lost soldiers and fighters in World War II is of great importance to the millions of families who lost loved ones in World War 2. I wondered about two things when I originally wrote about the Immortals March: (1) Why we did not have our own march to commemorate those lost in World War II and in other wars –Korea, Vietnam, Afghanistan, Iraq, Syria– and to give thereby solace to the families of the fallen; (2) Why American leaders did not attend the Russian March of the Immortals, as Russia was not only our ally in World War II, but without Russia we could have very easily lost the war to the Nazis. At minimum Russia helped save thousands of American lives. This year there is one major change in both the Russian Victory Parade and the March of the Immortals. 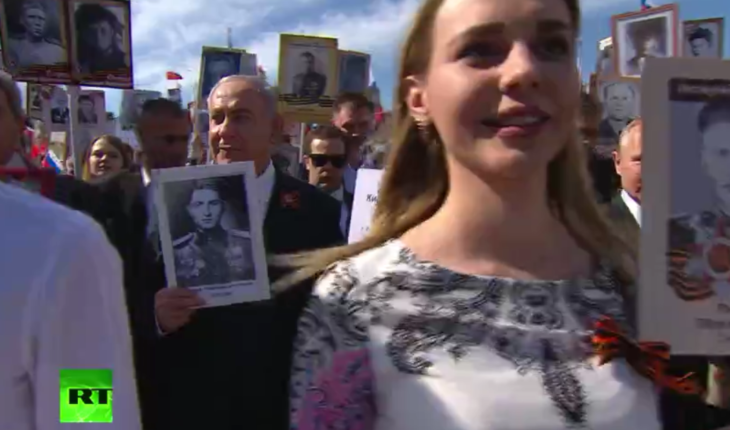 That is that one major world leader, Benjamin Netanyahu, Israel’s Prime Minister was at both ceremonies and he carried a placard commemorating a lost relative, marching alongside President of Russia Vladimir Putin. Keep in mind that the Victory Parade is a military display that features Russia’s latest weapons and shows off Russia’s top manpower. Even so, American officials used to attend, even in the darkest days of the Soviet Union. President Trump’s hand has been tied behind his back by the incessant and largely nonsensical and vicious Mueller investigation into Russian tampering with the U.S. Presidential election. This has made it impossible for the President to do much constructive in regard to moving the dialog with Russia forward. Thus there are no American principals at the parade. Perhaps there is a lesson with Mr. Netanyahu. 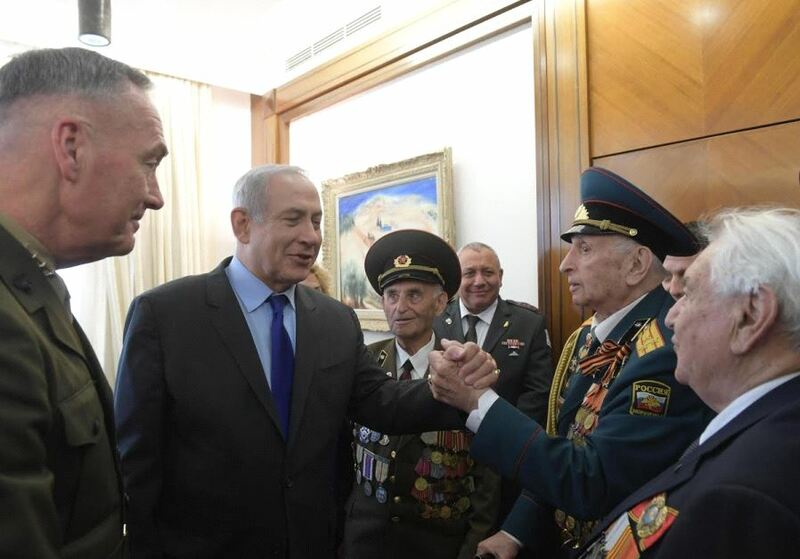 Israel cannot be happy with either Russia’s support for Bashar Assad’s minority government in Syria, or Russian connivance with the Iranians and Hezbollah. But nonetheless the two leaders have tried to forge some sort of modus vivendi, even in the midst of an Israeli bombing attack on Iranian positions in Syria the night before Netanyahu flew to Moscow to attend the ceremonies. If Putin thought the meeting with Netanyahu was fruitless or political inadvisable, be would have told Netanyahu not to come. But the reverse is the case. Russia has just marked the 72nd anniversary of the capitulation of Nazi Germany featuring a victory parade through Moscow showing the latest military equipment. Because of bad weather this year, a fly-by of around 75 aircraft had to be cancelled, but the rest of the parade went off despite fog, cold, light snow and rain. No U.S. representative stood on the reviewing stand. Russia became our ally in World War II and had Russia been defeated by the Nazis or the then-Soviet government under Stalin collapsed, it is a sure thing we would have had to make a costly deal with Hitler. Europe would have entered a dark age and America would be paying stiff reparations to Hitler and his evil successors. We need to remember that Russia suffered greatly. The generally accepted figure is that Russia suffered 20 million dead of which 8 million were military. Although at war’s start Russia was allied to Nazi Germany (the famous Ribbentrop-Molotov pact of 1939 that lasted 22 months), after Hitler invaded Russia Stalin had to mobilize his armed forces, re-energize and re-locate his industrial might, and recover from years of harsh Communism, depredations, gulags and mass killings. That he did so and Russia held together is, in itself a remarkable feat, attributed in the main to the courage of the Russian people. It is therefore quite appropriate to call attention to a remarkable part of the World War II Victory Parade in Moscow that has not gained much notice in the West. It is called the March of the Immortals. 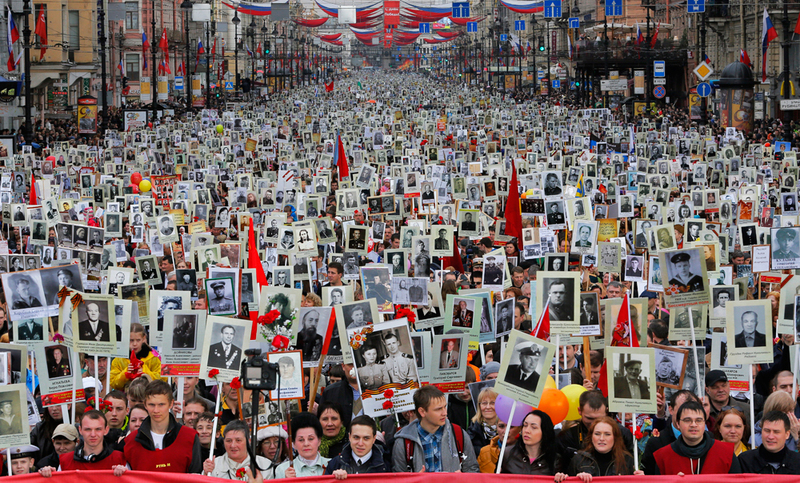 This March is a celebration and memory of those who fought in World War II, and it features the families of these heroes carrying placards with photos of the family members who fought then. Many were killed; others wounded and some survived and lived to old age. These days most of those holding the pictures are marching for their grandparents and, for some, great grandparents. The parade is a massive demonstration of the deep love and affection the Russian people have for their forbearers who suffered but fought hard and successfully in World War II, contributing with the other allies to Hitler’s defeat. While not all the numbers are in, in Moscow alone 800,000 people marched –a significant increase over last year where 500,000 marched in Moscow in the Victory Parade. Across Russia there are also Victory Parades and Marches of the Immortals, so the final tally will probably come close to 2 million. We don’t have anything that is quite equivalent, but there is a justifiable pride for veterans in the United States. A few years ago I was waiting for an airline flight at Baltimore airport. There was the usual crowds around the different airline departure desks, but nothing else remarkable. Then, everything went silent for a moment. Next applause, and the applause grew as the departing passengers starting some distance away walked up the corridor heading for the exit. They were World War II Veterans and they had come to the Washington DC area to visit the National World War II Memorial. People clapped and cheered them, stood on chairs and made it clearly and affectionately known how much they cared. It was entirely spontaneous and wonderful. It seems to me, as the ranks of our World War II veterans thin, that we should hold a March of the Immortals for those veterans, living and past who defended our freedom. Good in itself, our simultaneous honoring veterans with our Russian brethren families might be a good way to demonstrate that the sacrifice of our veterans, here and there should be above politics. Perhaps we can convince the other allies who fought the Nazis, especially the British, French, Polish, Commonwealth Nations and others to join in. It would send a clear, positive and humane message to the Russian people, and perhaps it will lead to some progress in resolving the divisive issues between our two countries.